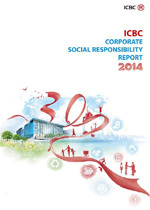 ICBC released 2014 Corporate Social Responsibility Report on March 26, 2015. This is the eighth consecutive year the bank published the report since 2007. KPMG Huazhen performed assurance procedures on the Report. This report consists of eight sections, including improving responsibility system, promoting economic transformation, building up global brands, advocating ecological civilization, reinforcing integrity building, caring about employees’ growth, devoting to public welfare and outlook. The report covers the bank’s key achievements in areas of boosting the real economy, supporting the small and micro enterprises, refining business procedures, improving customer service experience, advocating green finance, advocating green operation, protecting customers' rights and interests, enhancing compliance management, protecting employees' rights and interests, facilitating career development, dedication to poverty alleviation, and advocating volunteer programs.